Warm weather has arrived, and it’s time to hit the road! If you have a few days or a free weekend coming up, why not take an afternoon drive or an overnight road trip? There are plenty of exciting destinations within short driving distances, and your Ford Dealer near Chicago has plenty of vehicles to get you there. 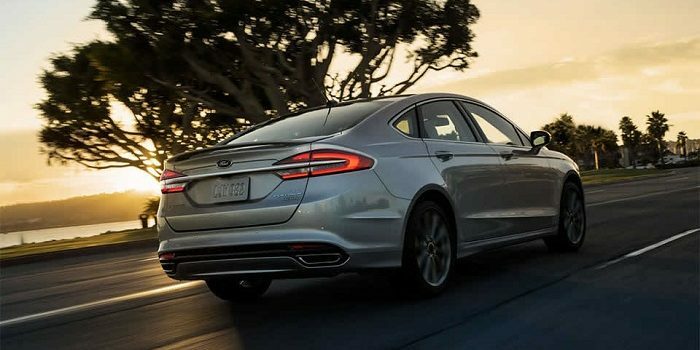 Let’s take a look at the 2017 Ford Fusion SE Sedan: it looks good, it’s fun to drive, and huge discounts are available now through the end of May at Roesch Ford in Bensenville, IL. Spacious, safe, and practical, this midsize family sedan will serve you well. When it first debuted on the market, it was an immediate hit with drivers, and now, five years later, it remains a popular choice for American families. The 2017 model offers the Sync3® infotainment system with smartphone-style menus and virtual buttons – just what you need to help you find your way to Geneva, Lake Delevan, or Starved Rock State Park. The new push-button ignition and rotary shifter free up space for useful cupholders and bins that provide easy-to-reach storage for your favorite take-alongs. The 2017 Ford Fusion SE trim comes standard with a 2.5-liter four-cylinder engine, automatic headlights, a rearview camera, cruise control, a tilt-and-telescoping steering wheel, an eight-way power driver seat with lumbar adjustment, and 60/40-split folding rear seats. The trip to Geneva, IL is an easy one-hour drive west. You’ll find all sorts of outdoor restaurants that provide cozy spaces to enjoy a relaxing waterfront drink. Spending the night? Check out the delightful Herrington Inn. Stop in nearby St. Charles, too, where you can order refreshments on the huge outdoor patio at Salerno’s on the Fox. But you might want to stay longer…the old-time paddle wheel boats drifting down the river are apt to make you linger! Roesch Ford hopes you come check out our line-up of 2017 Ford Fusion SE sedans now before your next Illinois road trip.